Try a Prog for Free! to create your free account. (Creating an account on DriveThruComics takes less than 30 seconds). 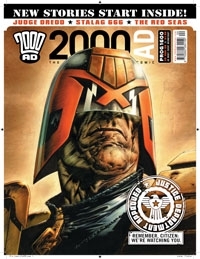 2000 AD is Britain's cult sci-fi comic, and has been at the cutting edge of contemporary pop culture since 1977. It's a multi-award winning cocktail of explosive sci-fi and fantasy, infused with a mean streak of irony and wry black humour. Imaginative, hard-hitting stories and eye-popping art have made 2000 AD essential reading for its legion of fiercely loyal fans for 31 years now. 2000 AD has been a proving ground for the finest young writers and artists of the generation, and many of the biggest names in comics today honed their skills within its pages. It has become synonymous with the very finest in comics art, and has won the Best British Comic award at the UK Comic Art Awards, National Comics Awards and Eagle Awards too many times to list. Not available in the UK? Exsqueeze me? This title was added to our catalog on December 11, 2008.